Democracy is set to go digital. After e-voting, there is a new topic on the Swiss political agenda courtesy of wecollect.ch: e-collecting. The platform has found a clever way of collecting signatures online that is not only effective and low-cost but also totally respects the law of the land! Today, political parties, associations and organisations all have a digital address book. The challenge, though, lies in turning these often extensive online contacts into actual signatures. 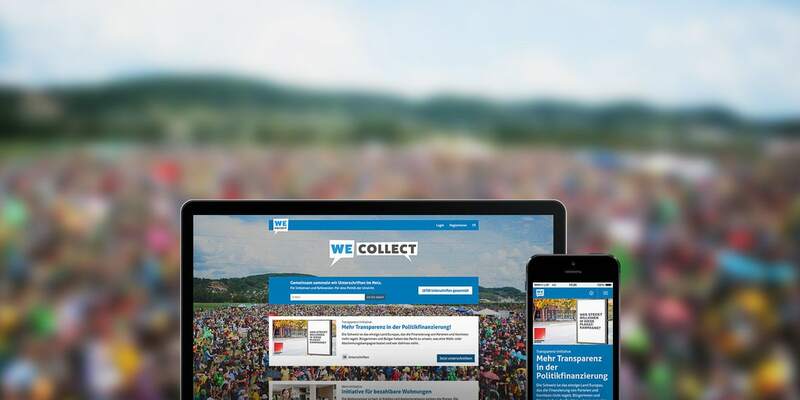 The wecollect.ch platform seeks to leverage this potential and harness the power of social media to get the word out and therefore create a snowball effect. wecollect.ch gives users the choice of signing an initiative anonymously or registering on the platform. With one click, registered users receive a pre-filled, post-payed signature form in their inbox. All they have to do is print out the PDF, sign it and stick it in a postbox. The platform builds on the E-Collector project, which in 2015 gathered more than 30,000 signatures for two popular initiatives and one referendum. The project took silver in the Public Affairs category of the Best of Swiss Web Award. The E-Collector process, which is integrated in the wecollect.ch platform, slashes the signature collection costs. The back end was built using Silex, a lightweight PHP framework. The databases are connected through Doctrine. As for the front end, the project team opted for Twitter Bootstrap and jQuery. In terms of email delivery, the developers went for the mail engine from MailChimp, Mandrill, among others. The system supports multiple languages, and this right up to URL configuration. A streamlined CMS gives the platform all the performance it needs and YAML is used to write configuration files. A SQL database provides the system with added support for address checks and other queries.